"Thermal Tolerance of Antarctic Fishes"
I have officially turned into a zombie - it is a running joke with the ship crew about "zombies" on the night shift due to the lack of sleep! Working from midnight to noon is all good if you can maintain a regular amount of sleep, but when that ends, the zombie state kicks in. It is actually more of a state of delirium than "zombieism." I made the mistake of going to sleep right after my shift and waking at 6 p.m., because now I will be up for about 24 hours straight! Oh, well! Sleeping is really overrated, especially when you get to do cool things in Antarctica! The fish have been much more elusive this time around fishing. We actually have had more success up near Low Island with certain species like the G. gibberifrons and the C. aceratus. The one species that the scientists need the most of is the C. rastrospinosus and we have not had very good success capturing this one. 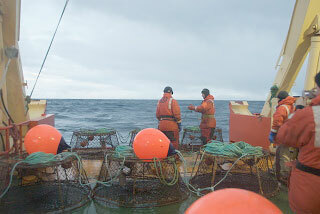 Even when we pulled the fish pots that we set yesterday, there were only a couple of fish in them. They were set in the same position in Dallmann Bay as we had before and they had many more a couple of weeks ago. That is fishing for you!